As the through trip was a little oversubscribed we decided to split the group and I took half into Pasg and Becca took the rest into Foel Fawr. 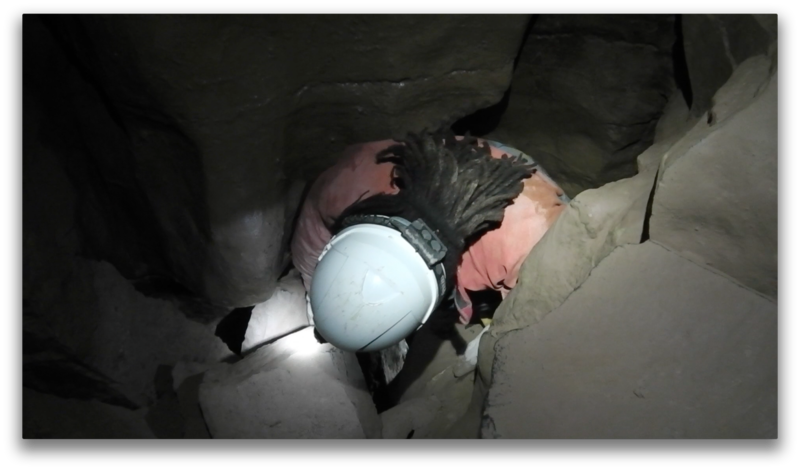 We found the entrance without too much issue and navigated our way over the sump and boulders to the ladder pitch. Rigging the ladder proved to be a bit of a challenge as we weren’t able to use the spits and had to use a natural belay backed up to a bolt further back from the pitch head. I belayed everybody down then started to climb down myself. When I was about half way down the awkward climb I heard Jess (who was belaying me) making squeaking noises to Mark. When I glanced down I saw the reason for her noises were because she was rapidly running out of rope! I managed to make it to 6ft above the ground before the rope ran out completely, at which point Jess had to start climbing up the wall to let me down, like a Victorian pair of weigh scales! As we walked through the canal we could hear the other group ahead and stopped at the top of the calcite slope for an exchange of tales of the trip so far. After informing Brendan of the slightly economical length of the belay rope we continued on to the connection. Once through the rather unpleasant u-bend we were at the fallen slab squeeze. I went through first, closely followed by Amy who flew through. Ian went next and needed only a little help to get across. Now Mark had been previously defeated by this squeeze and after learning that Brendan had made it through he was determined to make it also. 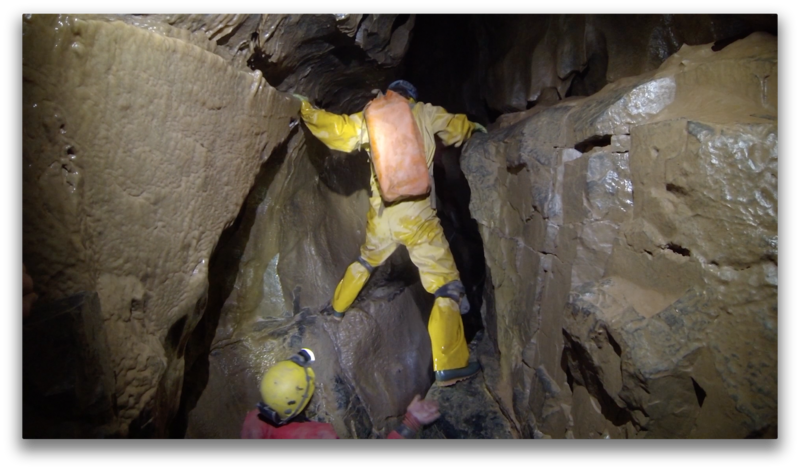 However he first wanted to make sure that if he were to get stuck, Andy and Jess would be able to get him back out, so they were asked to pull on his wellies as he breathed out. I guess they were expecting Mark to be a little more jammed than he actually was, as they yanked on his feet, shooting him backwards at high speed and bashing a delicate area of his anatomy on a nodule of rock. Oops! So after a few painful dummy runs and getting me to ‘passage size test’ to find the best route, Mark committed to the squeeze. There was a bit of puffing and hand holding but he got through with utter determination and even managed a little victory smile through the grimace of pain when he was stood back on his feet. After watching and listening to Mark going through Andy gave the squeeze a valiant effort but decided the bypass would be a better route. Now it turns out the bypass is not such an easy option when you are well in excess of 6ft tall with long legs like Andy, but he kept wriggling and bending his body into angles it naturally shouldn’t be at, until he popped through to join us. 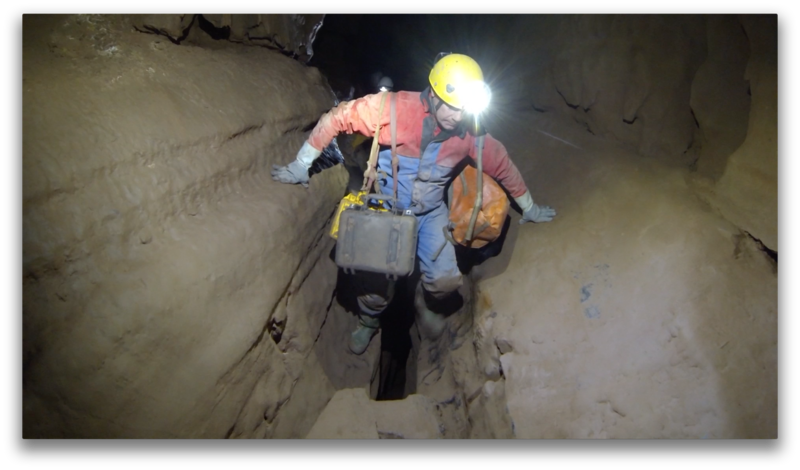 Everyone flew through the flat out crawls and up the muddy climb to find ourselves on the way out of the cave just in time to see the other group walking along lower down the quarry. Present: Ian Millward, Andy Williams, Jess Burkey, Amy Sawyer, Chloe Burney & Mark Burkey. 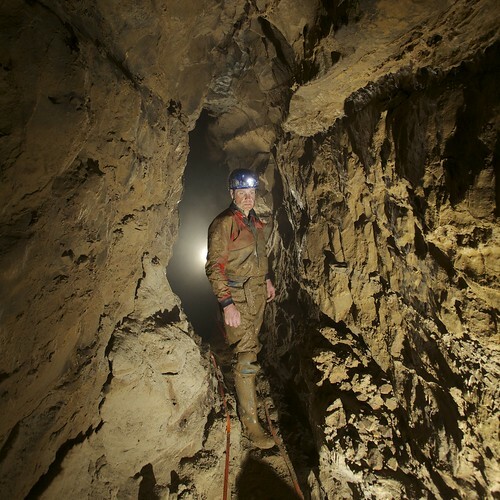 After the Ogof Pasg and Foel Fawr trip we decided to make the most of the extra hour of daylight on a flying visit to Ogof Gwynt Yr Eira to locate and explore the Road to Nowhere which we had failed to find on our last visit. After seeing off the rest of the team we headed across the road and started to uncover the entrance. 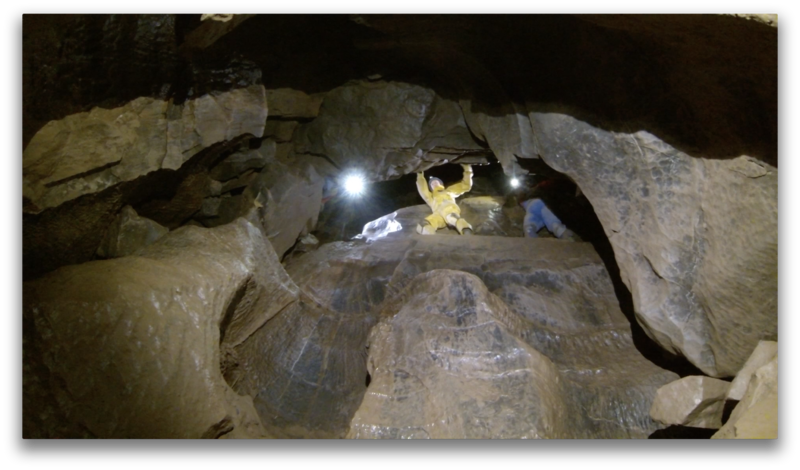 We were soon gingerly climbing down the entrance shaft and starting the climb down the first pitch. It was at this point that the rumble of a vehicle on the road above dislodged a rock, at this point Chloe and Jess decided that a visit to the ice cream van would be more fun than being crushed to death by falling rocks, so Brendan dropped down the entrance climbs to collect the car key off Mark and take it up to them. 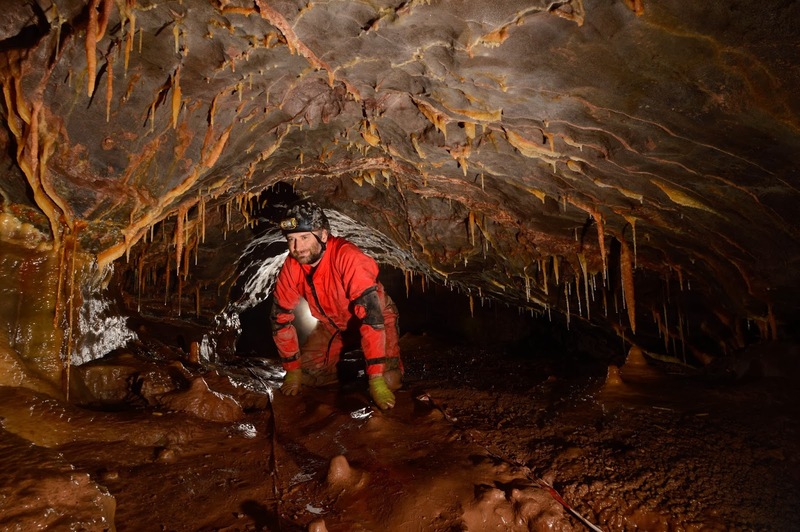 After a few minutes Brendan was back with Mark and we continued into the cave and were soon popping through the cosy entrance to Alaska. 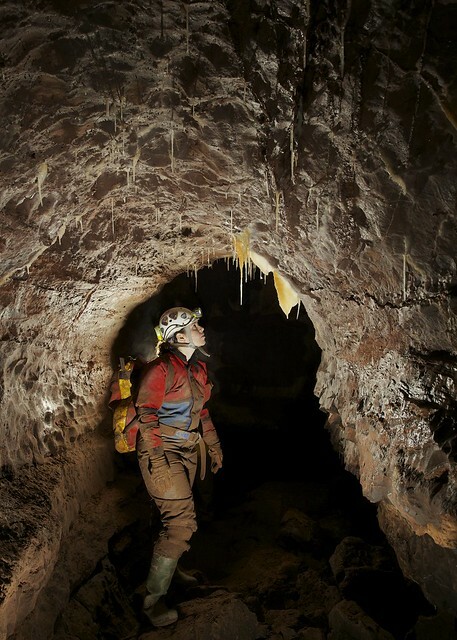 We continued keeping to the left of the passage until we reached a steeply descending tube with two ways off at the bottom. On out first trip we had gone left, after discounting the tight rift on the right. However this time we would force ourselves through the squeeze on the right and were soon in better passage. The respite was short lived as we then headed over a slippy downward traverse to reach a tight slot down at the end which led to a letterbox squeeze emerging at the top of a 10m climb. Popping through legs first footholds were found on the opposite wall of the shaft and a short climb down onto a wide ledge allowed us to see the rest of the climb down. Mark free-climbed down while Brendan attached a handline which was useful on the lower part. We were now in large clean washed passage and stepping across a rifty hole in the floor entered a sandy rift and the start proper of the Road to Nowhere. A chamber with several routes off was soon met where after exploring all options we took a climb down into the obvious rift passage that heads off from this area. Some fine areas of sediments were passed until we reached a point where a stream headed off down to the left to reach a passage too small to follow far and to the right the passage passed some impressive sediment banks to reach a muddy sand choke at the end. With time against us we took a handful of photos before making our way out and meet up with the others as planned. 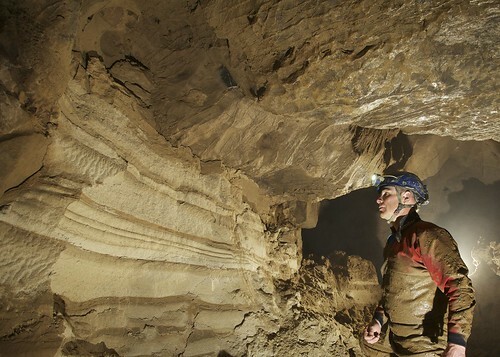 With eleven cavers it would not be practical to operate as one group, and so we decided to create two teams and do the through trip as an exchange with one team going into each entrance. Chloe and Becca were nominated team captains and so they selected their victims. This report follows Becca's team that entered via Foel Fawr. Becca not being aware that it was going to be down to her to lead the trip, now had to find a cave entrance on a hillside that she had never visited before. 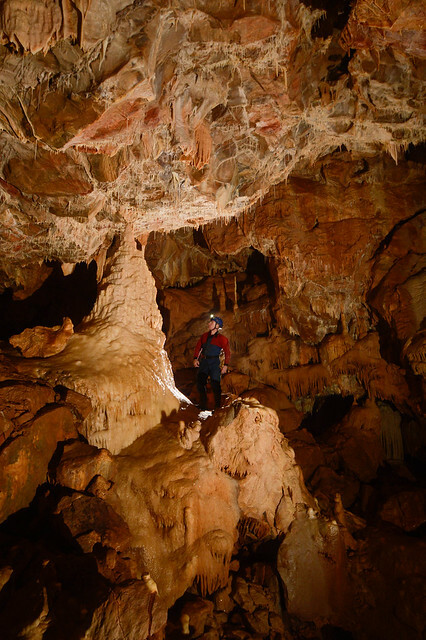 To make it worse, the cave can only be seen from a few metres away. After a false start following the other group, Becca's team split up to scour the hillside for the elusive cave, and after a short while Loz made up for her late arrival by locating the entrance. 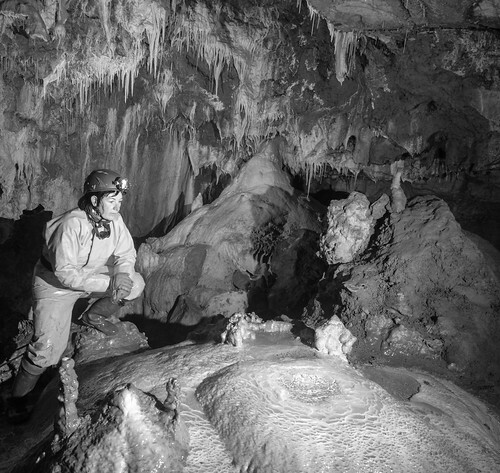 We were soon underground and in a pattern that was to be repeated through the day, all passages were explored, with us soon heading to explore a dead end. A quick check with the survey saw us on our way again and we were soon at the Fallen Slab squeeze. 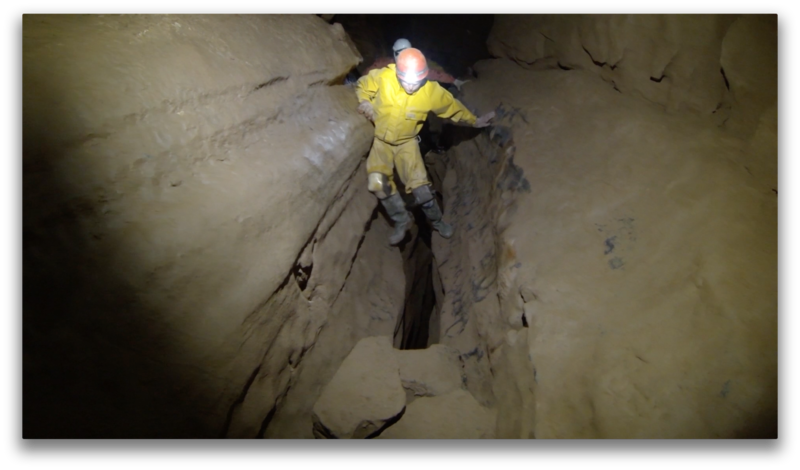 Keen to not miss any cave, the group headed past and to reach Bone Chamber where the only way on was followed into the Hereford Extensions to find a dig and static sump at the end. We then headed back at the Fallen Slab, and being at the back was a little surprised to find all had slipped straight over it by the time I arrived. I followed feeling a little pinched half way through. Ahead I heard a call that they felt they had reached a dead end, when it was explained that the way on included a duck like going down the U-bend of a toilet a groan was heard followed by squeals as they passed through. We were soon at Pillar Chamber where we could hear the other group coming down the pitch. We spent a few minutes taking photos until the ladder was free and then headed through the canal to reach the ladder. With the ladder rigged from the natural thread it ran over the smooth calcite near the top making it a good test for the new members. 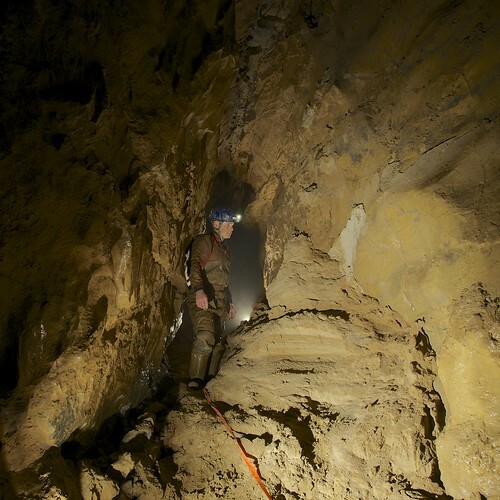 All climbed without any problems and we were soon packing up the kit and heading into the main passages of Ogof Pasg. Becca wanted to keep exploring and led the group into Bunny Run passage, not stopping until reaching the bitter end. 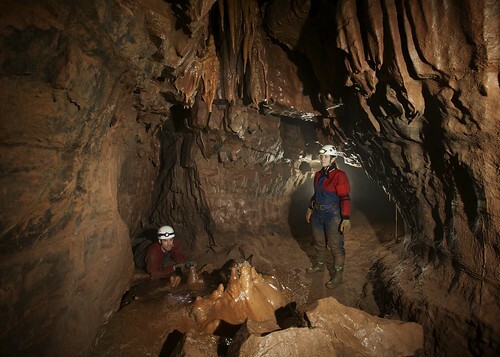 A few photos were taken with the group before the final dead end passage in Ogof Pasg was explored by Becca until they reached the very, very muddy end, I was glad we took the photos before they went into that one. Back on the surface we met up with Chloe's team as they emerged on our walk around to the car park. The two trips had been perfectly timed. Due to the fact that we failed to find Derbyshire Hall on our last trip to Nettle, we decided we would need to return fairly soon while the route was still fresh in our memory. I had travelled up to the Peaks wearing most of my kit, so on arrival all I had to do was jump out grab the rope and my SRT kit and head off to to start rigging the entrance shaft so as to help speed up getting people down the entrance shaft, so that was that and i was soon at the bottom of the shaft closely followed by the rest of the team, we soon made our way crawling through the sticky mud to the second pitch down, where Mark took over the rigging, then came the rope climbs up and by now it was getting difficult to tell what was SRT kit and what was clay, another short crawl over the far flats followed, and then finally the last pitch down was found - success - Mark went first followed by Major Andy then me, on my arrival at the bottom of the pitch I was called to the front to try Freeze Squeeze as Mark couldn't fit, I tried helmet off and head first, I tried on my back and feet first but it was a no go, I then asked Steve to have a go but he had the same result, I tried again feet first, breath out wiggle a bit breath, I was moving slowly but surely, but then disaster I had a large piece of the roof right in the gonads and my chest was stuck, and no matter how hard I tried, I couldn't go any further into the crawl, bugger, getting my self out of the crawl wasn't very easy either, so that was that-failed, oh well, we all slowly but steadily made our way back across the mud to the pitches out, and by now we were all a nice shade of brown from head to toe, finally, once we where all on the surface more than a few of us agreed,we wont coming back to nettle again, bl**dy shi*t hole, well not while its still fresh in our memories anyway. Mark narrates the story with occasional interjections by Brendan and Jess. Brendan had arranged for a leader for this trip, but he could not join us, explaining that “he didn’t want to catch any nasty diseases before his holiday, as his last trip in there had left him with a nasty ear infection”. 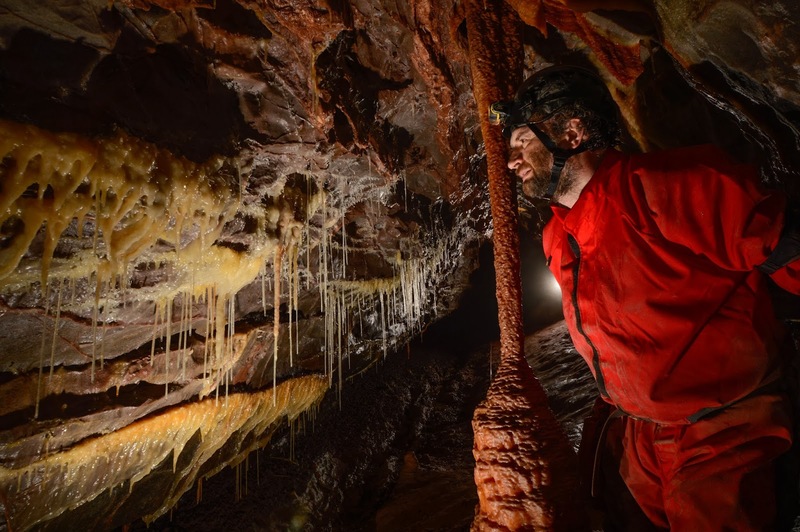 Although anyone sensible would think that going into a cave with known prevalence of Weil’s disease would be enough to put anyone off, let alone the knowledge that the only way in to the main cave is to be fully submerged in filthy smelly water, we had received glowing reports from several cavers that the trip really was worthwhile, and the sump was nothing to worry about. Brendan arrived at ours on time at 8am. While having a quick cuppa Brendan spotted Mark's camera by his computer and realised that he had left his camera at home so Mark packed his and we headed off to Stoke St Michael and the objective of the day Stoke Lane Slocker. 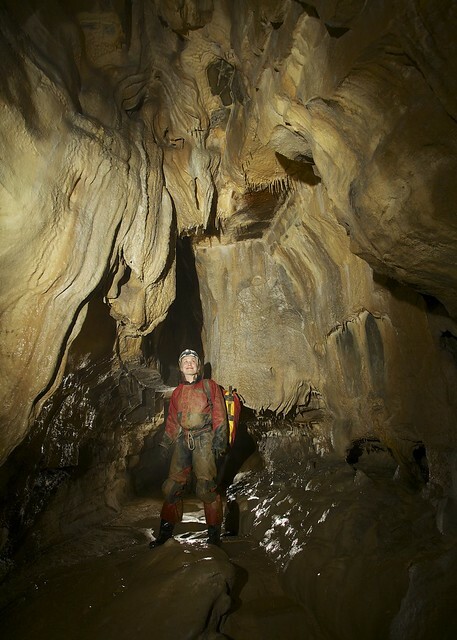 We arrived at around quarter to 11 and before kitting up decided to locate the cave first. We quickly found the a rather wet looking entrance and at this point Brendan admitted he was a little worried about the water levels as it had been raining the day before and heavy showers were forecast for later that afternoon. 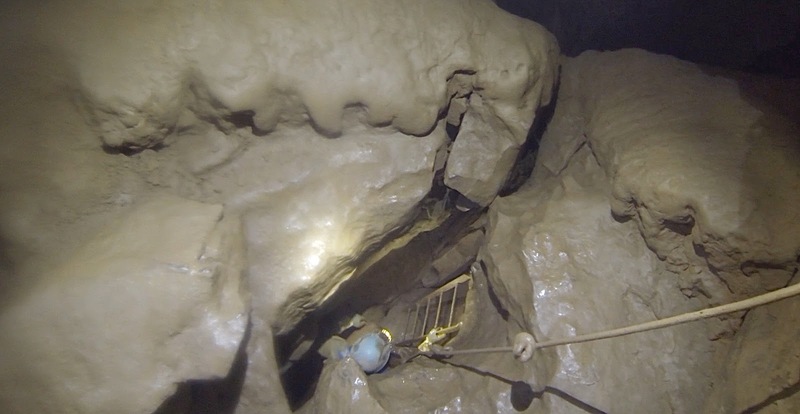 The only photographs we had seen of the entrance online had shown it in dry conditions so we had no way of knowing if the levels were safe to enter. Fortunately we had just enough phone signal to look up the number for the Belfry and call for some local knowledge and were able to confirm that from our description we should be ok. 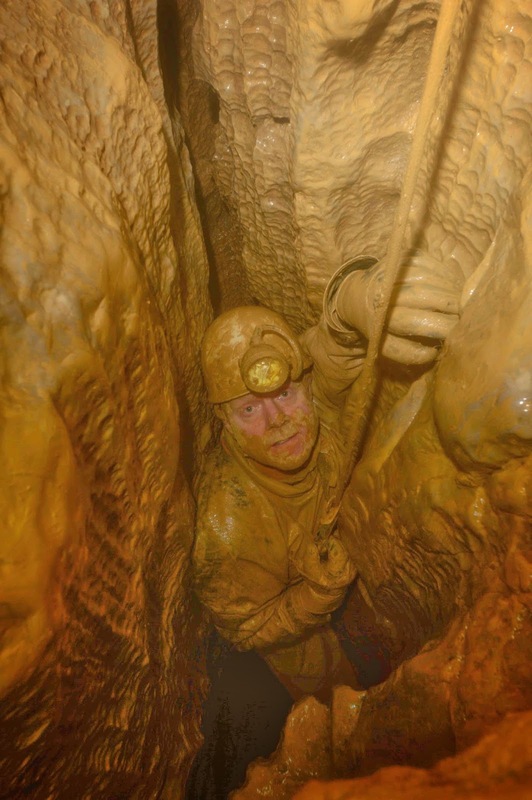 Going through the entrance is a little like being flushed down a slippery latrine! Not far in I found I was having a struggle getting caught on the many tree branches that had washed in the entrance and a little gardening was required to continue, passing out the branches, unfortunately Brendan was sat just inside the entrance and had the full force of the water going down his neck during this task. We were soon sliding through the Muddy Oxbow and then washing off on aqueous Pebble Crawl before making our way through the Corkscrew and our first real obstacle the Nutmeg Grater. At this point Jess had a little trouble with the contortion, her hips wedging solid as she tried to bend her legs in a direction they just wouldn’t go. Brendan tried the alternative route over the top, but this proved even more tight and awkward to navigate. Having gone through first I suggested Jess try it facing the other way, but she said she was ‘not feeling it’ and wasn’t keen on going any further. As we were only 5 minutes from Sump 1, I suggested myself and Brendan take a quick look in anticipation of a return trip and then we planned to all head out together. Brendan slipped through to join me and we were soon at the rather intimidating squeeze/duck combination. I lay in the water ‘acclimatising’ as I tried to figure out how to get through. The only way was to remove your helmet, slide your body under the water and gently fit your neck through a narrow slot whilst turning your head to the side submerging one ear. At this point Brendan heard Jess calling and thought she may be in need of assistance. I assured him it was more likely that she was through and calling to ask if she should grab the camera box, which I’d left back at the contortion. After a moment we heard the clatter of the box a saw the glow of her light as Jess re-joined us. Jess later recalled that "Once they were gone I had another look at the squeeze and this time managed to work my way through. Flushed with success I grabbed the camera box and set off in pursuit. Mark greeted me with delight that we could continue the trip, Brendan didn’t look quite so pleased". My joy at having managed the duck and Jess overcoming her ‘moment’ was short lived as I rounded the corner to see the flotsam floating on top of the confined sump pool. Brendan and Jess seemed to have little problem with the duck as they were soon at my side. Brendan and I had both researched the trip and we both knew that going in should be no problem as there would be plenty of airspace. None of us seemed eager to be first, but as the longer I leave something the less I like it, I volunteered. Handing Brendan my camera box I took a couple of deep breaths and descended. I was half way through when I felt my head yanked back and instantly realised the twin guide lines had tangled with the battery pack on the back of my helmet. I tugged forward but they were too tangled to break free. Controlling my rising panic I kicked back through trying to find the small slot I’d just dived. Brendan at this point, seeing a light shining in the water coming back through, assumed it was me waving my helmet to signal for the camera box, so he was trying to push it through as I was trying to return! Finally breaking the surface I explained what had happened so no one else would have the same issue and tidied the guide lines ready to have another go. This time I slipped through without issue to come through to what was meant to be a reasonable air space. My helmet hit the roof and I could feel my nose and mouth still under the water. Opening my eyes I could see air space in front of me and quickly made my way to it. Looking back at the sump there was less than 6 inches of airspace for the first ten feet but there was no way to communicate this to the others so all I could do was wait. Brendan was next and did exactly the same as me, hitting his head on the roof of the passage. I shouted to him that he was through and to come toward me. Finally Jess’s light emerged and again she was caught out by the limited airspace before I grabbed the collar of her suit and dragged her to us. I think all three of us took a final look at the sump, knowing that it is described as more awkward on the return, and wished this were a through trip. Glad to be through, and ignoring the fact that we would have to return, we made our way into the main part of the cave, which was indeed magnificent! 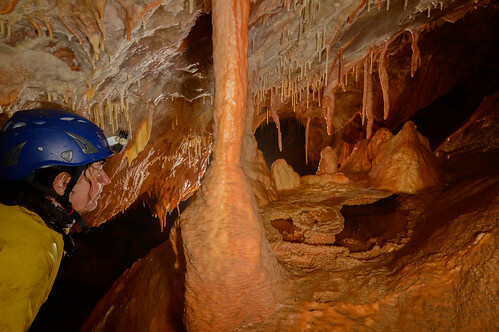 Entering Main Chamber all thoughts of the sump were forgotten as the huge stalactites came in to view. Both Brendan and I were feeling hypothermic at this point and were having trouble stopping shivering, fortunately a quick look around the chamber and climb up to the traverse began to warm us up. 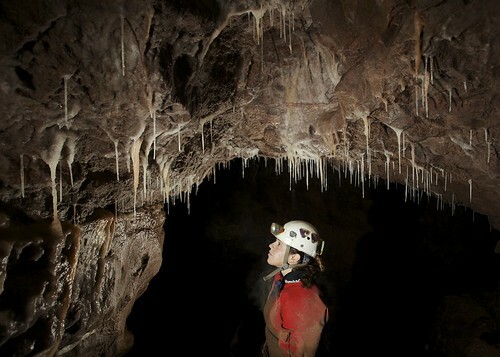 Very pretty formations and a really nice little round trip with climbs up and down through various chambers followed. Jess recalls that Mark wanted to photograph everything he saw, but she was growing ever more conscious of the time ticking away. At one point as he moved his camera box, something fell out and fell down through boulders. “Oh no, my lens cap!” he said, and started hunting for it but it had fallen quite far. “Come on, leave it!” she advised, “We need to go”. However, we were all very glad that he persisted – as it turned out not to be the lens cap, but the one and only van key! Returning to the sump I again elected to go first rather than stand around thinking about it and as I came up found that I needed to turn my helmet to the side to break the surface. Again there was no way to impart this tip to the others so all I could do was wait. I gave two good tugs on the guideline to let the others know I was safe. I felt the line go tight and waited for the next person. I thought I saw a light in the murk and then....nothing. 30 seconds went by and I began to feel a little sick at the thought of someone in trouble. Unknown to Mark, Brendan recalls that he had tried to dive through with a tackle bag and camera box. This was just not going to work and he backed out of the sump to try another strategy. Slings connected the bag and the camera box together and so he approached the sump again to pass the gear through. 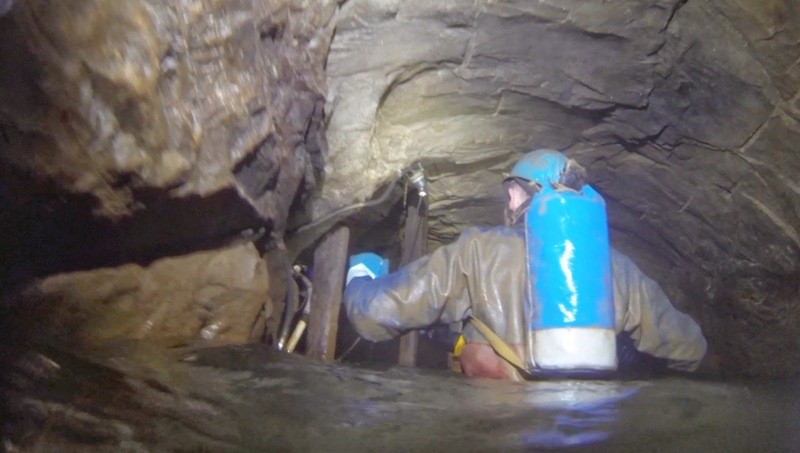 The bag was plunged down into the murky depths and the forced upwards in the hope Mark could grab it... Meanwhile at the other side Mark takes up the story as he grabbed the guideline, but it was still tight and then a red helmet slowly floated to the surface. With my heart in my throat I reached down to find it was actually our red hand line bag. My relief was short lived as it dawned on me that the last time I saw this it was attached to Jess’s belt. With everything I had I began pulling on the bag, trying to yank Jess through till finally the sling attached to the bag pulled through my camera box and I realised what was happening, - the others had decided to send these through ahead of them. Mark heaved the bag up with all his might, but the slings caught around Brendan neck and dragged him to the sump where he fought himself free and plunged the buoyant box down into the sump. Next Brendan dove through, as I had done he began wedging his helmet the wrong way in the rift below the surface of the water and I had to reach down, turn and yank his head out of the water. Spluttering and blowing bubbles of joy he looked very shocked at the fact he was actually still alive. Moving out of the airspace to make way we awaited Jess. A couple of minutes went by and eventually there was six frantic tugs on the line. Another ten seconds and another six tugs. As Jess now recalls she had taken a deep breath and dived under the rock, pulling on the line, but the rock just seemed tight all around her, and so she backed back out. The trouble with backing out was that the airspace was so limited that she had to back up quite a few feet before she could breathe again. Another deep breath and another go, but the same story, just tight all around! She backed out again until she could breathe. One more go – She tried to pull herself right along the line, but felt herself wedging solid under water, so dropped the line, couldn’t find it again with her fingers, then panicked and pushed herself back out again. She was despairing of ever getting through the sump! The only way was to get Mark to come back and help her, so reluctantly she gave half a dozen tugs on the line. Someone tugged back, so again she tugged 6 times, hoping they’d realise she needed help. Brendan and I knew she was having trouble. We exchanged a look and I dove back through to see what I could do for Jess. Reaching her I found her a little distressed. She had tried to dive through three times and every time had found a tight spot that wouldn’t allow her through. I explained the technique and she had another go. Again she didn’t make it and came back again. This time I had seen her problem and one she stopped crying I explained that she needed to dive lower and use the line a guide rather than hauling on it. On her fifth attempt she was through but had overshot the airspace and was heading into a tight slot. 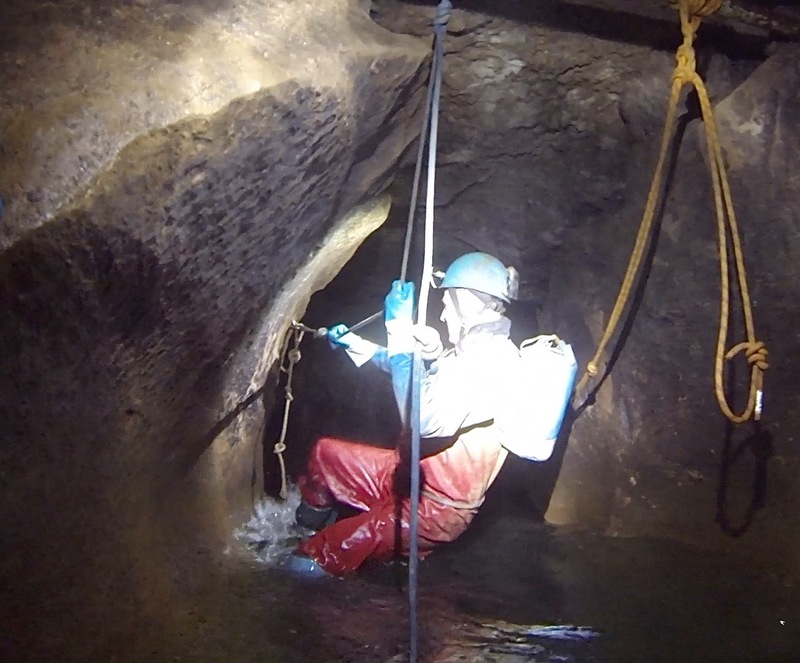 Brendan plunged down into the murky sump and grabbed the collar of her oversuit, to pull her to a position where she could be guided to the air. Brendan's hands then firmly grabbed each side of her helmet and pulled her up through the rift into the airspace. Once clear I dove back through for the last time and we happily retraced our steps without issue to daylight. Although there was evidence of some showers we were grateful to find that the heavy rains had not materialised. We drove back in the van, in which Jess had set the heating on Gas Mark 12, we did not complain as it took over an hour before we could feel our fingers again. Back at our house we did a little more research and checked pictures of the duck and sump as both had not been what we were expecting. It was only then that we found out that we had done the trip with 12 inches higher water levels than any photograph or trip report we could find on the net! Present: Brendan Marris, Jess and Mark Burkey. At my time of life I should be taking it easy, winding down from silly pursuits like caving and spending more time in my garden with my beloved trains - not leading a serious trip in the Peak/Speedwell system, but Mark wanted to see the Far Sump Extensions in Peak and Brendan wanted to say that he had been to the bottom of Titan and back out. As far as my failing memory serves me only two people from the club had ever been to the bottom of Titan and as Wal isn’t caving at the moment, it seems, it was left to me to lead the trip, and I really would have liked to be with one of the other groups having a nice stroll around the tourist places! I thought that if I’d got to do it then I would try to capture some video, but as I knew that it was going to be a muddy and wet trip I elected to use the GoPro camera mounted with the Chesty (chest mount). In spite of my trepidation things started quite well, until I planted myself face first in the first pool we came to. Both the camera and I ended up submerged much to the delight of Brendan and Mark who thought it was hysterically funny. We then made our way along Upper Gallery and through Treasury Chamber to the gate at Faulty Tower. The long standing club members will recall the incident when John Smith came back to the gate and found it locked. He grabbed the bars with both hands and rattled them like a caged gorilla. Be sure to ask for the full story sometime - it is worth recounting. 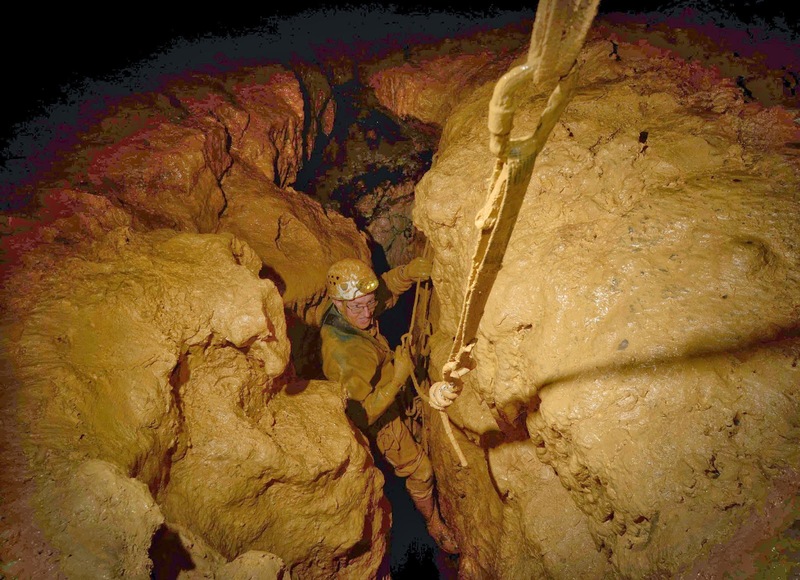 A fixed ladder at Faulty Tower leads to the Trenches and then the infamous Colostomy Crawl. I don’t need to tell you what it’s like - the name says it all. Another fixed ladder leads down Egnaro Aven from the end of the crawl to enter the Lower Bung streamway. This is followed upstream via a flat out Oxbow to the Bung waterfall. 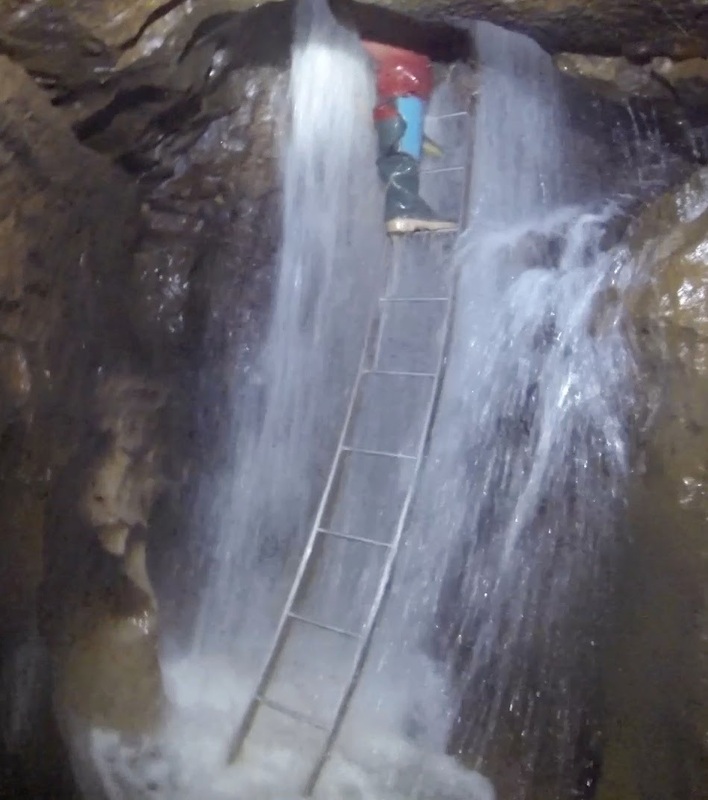 A fixed ladder goes up through the middle of the waterfall to enter the main steam in Speedwell. 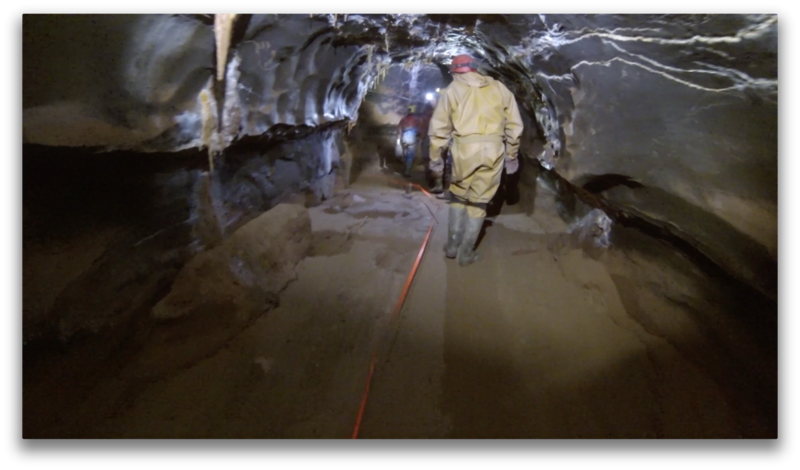 This is followed upstream via the Whirlpool to a boulder pile where an aven can be scaled to enter the bottom of JH mine. From here an excavated crawl connects to Stemple Highway with its pitches and traverses. I don’t think I mentioned the traverses to the other two as I know how much Brendan likes traverses. After this my memory was getting a little hazy and I took a wrong turn and ended in a dig off Salmon’s Cavern. Turning around in an almost impossibly tight spaced caused much more mirth for my companions. Back on the correct route I found the bottom of the Titan boulder choke. 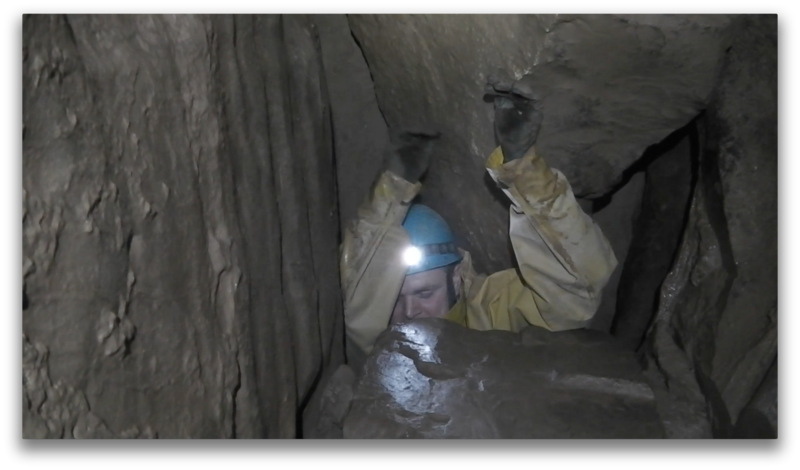 This is the largest choke I’ve ever been through - the boulders are stacked for over 100 feet and above them is the bottom of Titan, the largest natural shaft in Britain, 492 feet high. 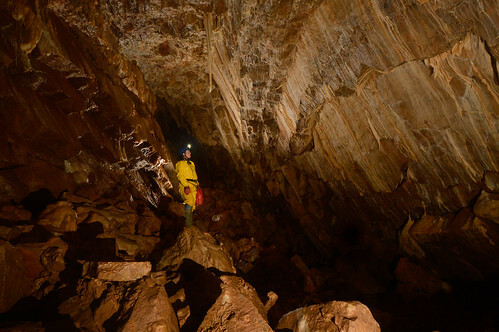 After this dropped down to Far Sump and then explored AJ Passage before making our way out to emerge from the show cave 6 hours after entering it in the morning. Now I’ve always said that I would know when it was time to pack up this caving lark. The measure would be when I became the slowest member of the team and therefore held the others up. On the way out that happened. Time to slip off and play with the trains I think. The pictures are stills from the video below. The Team: Brendan Marris, Mark Burkey and Keith Edwards. 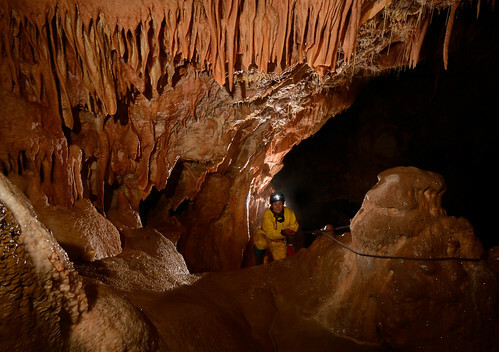 Two groups entered Peak Cavern to cover the trade routes up the main streamway and to visit Moss Chamber. 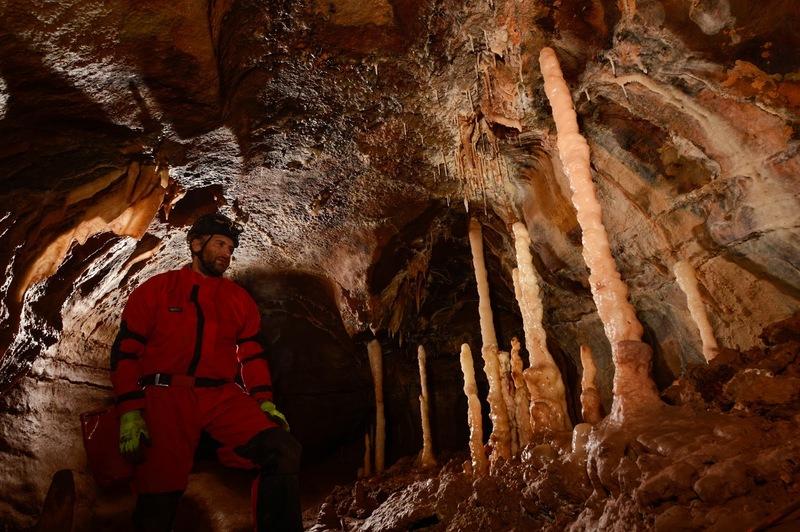 Clive Westlake accompanied one group and took the following stunning images. On Thursday Andy approached me for a gentle Sunday trip, so as Brendan, Chloe and I were to be in South Wales for the weekend I invited him to join us on the Sunday for a trip in OFD Top Entrance. As Brendan had a meeting to attend it would just be Chloe, Andy and I on the trip. There were a couple of areas I hadn't visited since getting in to the photographic side to caving and so thought I'd add these to the usual suspects of the more tourist parts. Our first objective was to do the awkward 25ft climb up to the Mini Columns. I went up first and rigged a hand line. Now both Jess and I have been known to strip off our over suits in the past to facilitate a tight squeeze, but I'd never before heard of anyone shedding their over suit for a climb! Andy was next and managed admirably without needing to use the hand line. Everyone had no problem with traverses and we were soon at my next photographic objective; Frozen River. After a few more pictures we reversed our route, taking in the awkward, occasionally snug, crawls and rift alternative to the slippery climb back up to Gnome passage. At this point we only had a few hours left till our call out so I gave Andy the choice of what he fancied doing. His reply was he fancied doing the same trip as Keith and I had taken the others on the previous week, so at a reasonable pace we replicated the previous weeks route. What I hadn't known was that Andy had only had a few hours sleep the night before, having been in North Wales. By the time we exited a rather overheated and tired Andy was very glad to get back to the club for a shower and cuppa before the long drive home. This was a trip on the top of our bucket list for some time, but with the exceptionally wet winter the direct route up the streamway had been out of the question for some time, and this weekend was our first opportunity to get into it. A late start due to the A465 being closed and an extreme tea drinking session starting on arrival at SWCC, it was almost noon when we disappeared underground. The water in the streamway was down to near normal levels and we were soon sliding through the boulder choke, the sump making much less noise than the week before. Through the connection we went and then headed up a boulder slope to find a passage that would lead us into OFD 1.5. 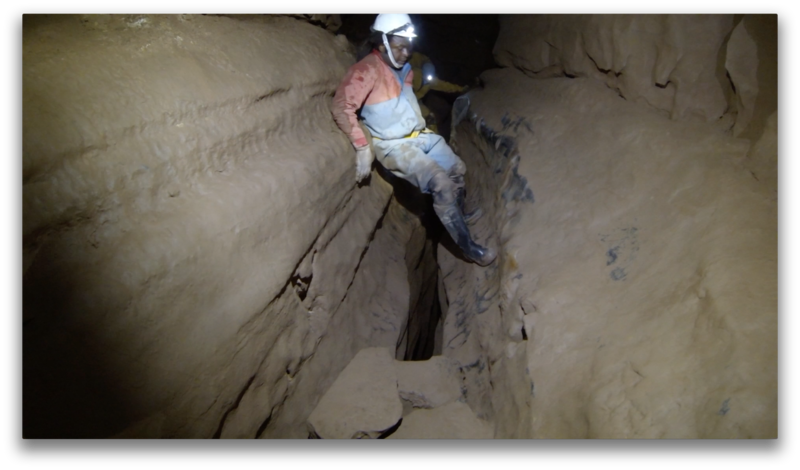 Soon we had found what was marked on the survey as the tight slot and down we slid, this would be harder on the return. 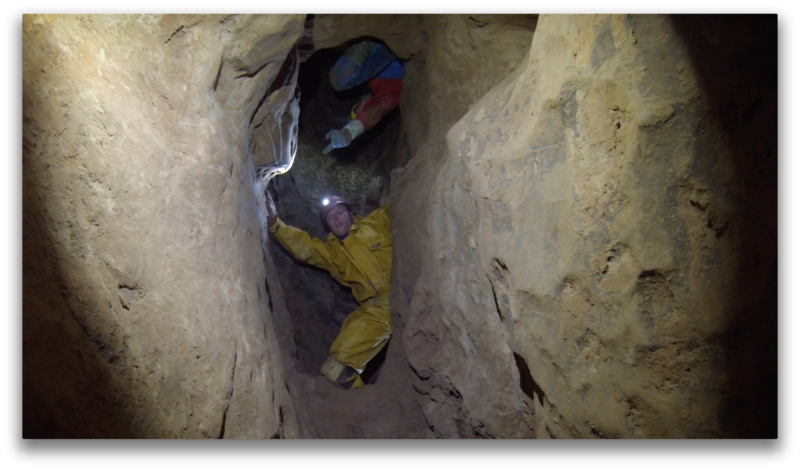 We then dropped down mud cemented boulders into a passage and followed it for quite a distance until it ended in a dig. Consulting the survey we identified the location of the connection with the large passage above and soon Brendan was trying to squeeze through boulders at the top of the mud slope. He had no luck so Mark then took the lead making it through and so the rest followed. We explored the massive passages, and then climbed up a balcony to explore a total maze of passages. At one point Mark located a climb down that will make a much easier route into this series on a future visit. Back in the main passages we followed a large loop through a super loose boulder choke to reach a passage that had been dug through. Passing through the dig we followed a crawl for some distance to reach a beautiful dried crystal pool and a climb down to the top of the Knackeracker pitch. This was just as nice as it sounds and the ladder can only be rigged in the tightest part of the rift so was fun on the way down. At the bottom the passage ends both ways, but is decorated with a fine array of helictites. After a few photos we headed back up the pitch, an altogether more serious undertaking in reverse. 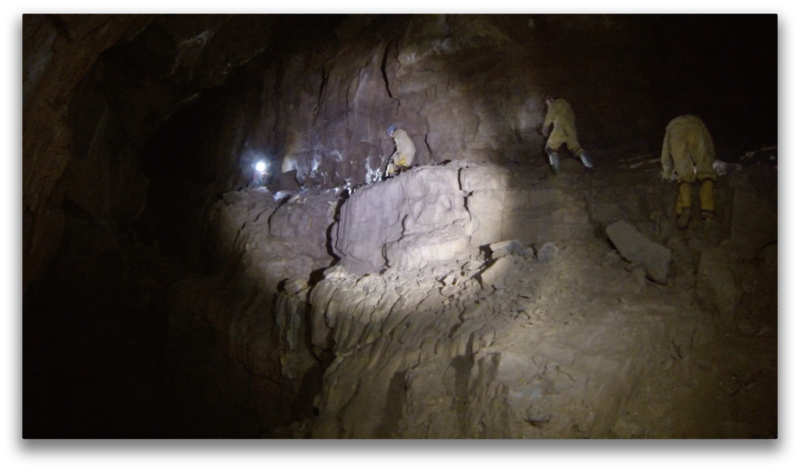 After a lot of puffing panting and a little of the heave ho we were all up and then made our way out of the cave. 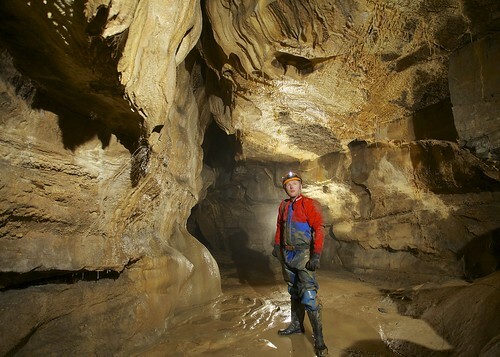 This was a great area of the cave to explore and will return to complete the final section of this series. 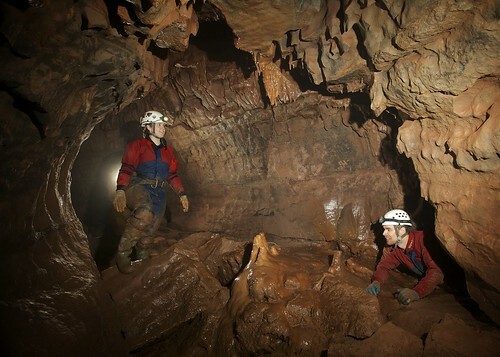 When I first started caving and reported home with stories of terrors and tears, my eldest brother brushed off my tales and informed me he went caving once when he was young and it was pretty easy. 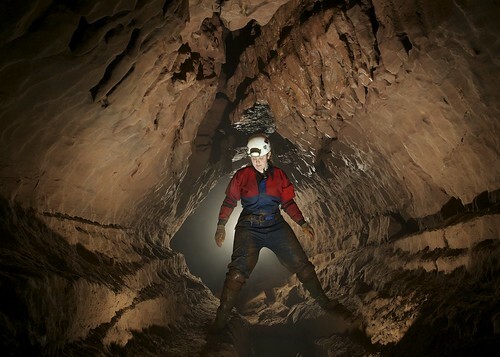 Determined to show Paul that what I get up to most weekends was not quite the same as the ‘caving’ he did as a 10 year old boy, I kindly signed him up to the club as a special Christmas present. On receiving the gift, Paul told me he didn’t want ‘just a normal novice trip’ and fancied something a little tastier, so a through trip from OFD 1 to Cwm Dwr was proposed. The first achievement of the day was managing to get Paul awake in time for Brendan arriving (who himself was a little late as a result of sleeping through his alarm). We met Jess and Mark at South Wales Caving Club and introduced Paul to the tradition of tea drinking and pre-trip faffing. Once changed, we walked down the hill to OFD 1, by which time Paul was looking rather apprehensive. We headed straight to the streamway to find the water levels were high but just about acceptable to continue, which made for a sporting start to the trip as we wadded our way upstream. Upon leaving the water we went to boulder chamber and through the choke followed by The Connection. The Letterbox proved a bit of a challenge for me, as even with the assistance of a sling to stand in, it was almost at shoulder height and I required a pull on the arms from Brendan and made a wellie shaped imprint on Mark stood below, to get up and through the slot. Once through the crawls we arrived at the top of the Diver’s Pitch where it was revealed that a dislike of heights was a Burney family trait. With some assistance from Mark we made it down the climb, although Paul’s legs were doing a bit of an Elvis shake which he conveniently blamed on low blood sugar! Our route took us past Piccadilly, along Upper Piccadilly Streamway, through the boulder choke and Cmw Dwr Jama to the crawls. Paul was beginning to tire but kept pushing through the crawls and out to the climb. With a final little shove from Mark below, out he popped out from the concrete pipes and back into the daylight. Everyone enjoyed the trip although Paul admitted he felt a little too battered and bruised to return underground for a while. Most importantly for me, he has a new found respect of what his little sister does at the weekend! 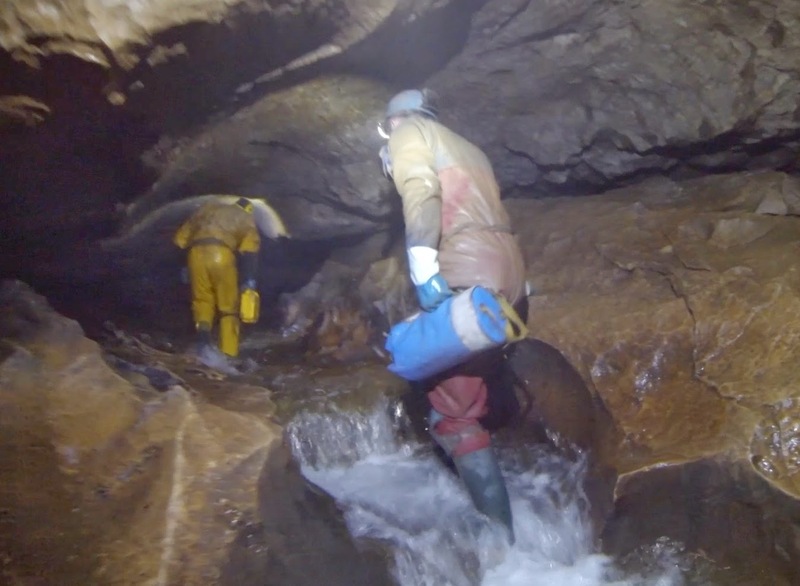 After spending weeks and weeks training people the basics on the mill id decided it was time for Amy and Josh to put it in to practise for real, so a trip to Jug holes and Carlswalk was arranged. Jug holes was our first destination as the entrance shaft is only a few feet from a lower entrance so if they didn't fancy the abseil they could just walk in, Amy was first to try and actually entered the shaft a lot quicker than she or I had wanted almost giving me a heart attack, she had lost her footing while lowering herself in -its a good job people listen when you tell them they HAVE TO USE COWSTAILS for safety. 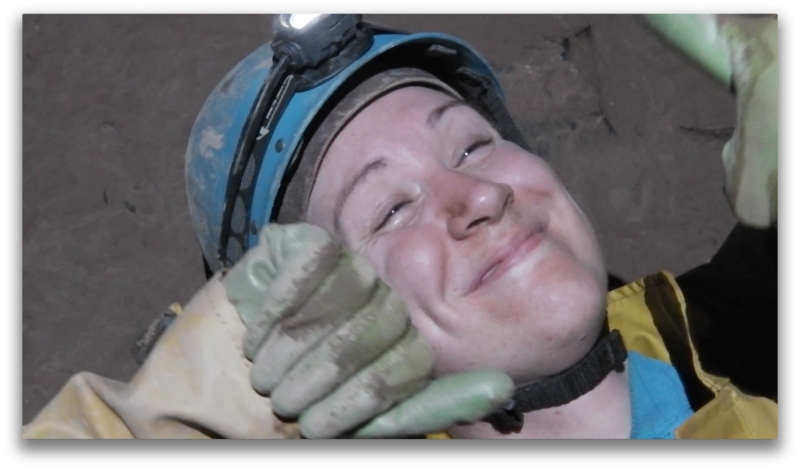 So after a few abseil practices while Pete and Josh played in the shaft, Amy was encouraged to find her own way through the system with the odd prompt from myself. After lunch I wanted to find Old Ash mine beings it was less than a mile from Jug holes which didn't take to long to find, then we where off to carlswalk cavern to enter via Eyam shaft which Amy and Josh found easier than jug holes to absail into, at the base of the shaft it was decided just to do the short through trip beings Pete was only wearing normal clothes under his over suit ( ha ha ha ha) so I led with Pete at the back threatening to kill me when we reached the large puddles ( needless to say I went slowly through them so that he received the full effect of the water ) then all to quickly we where out and it was time to get changed and head off home. 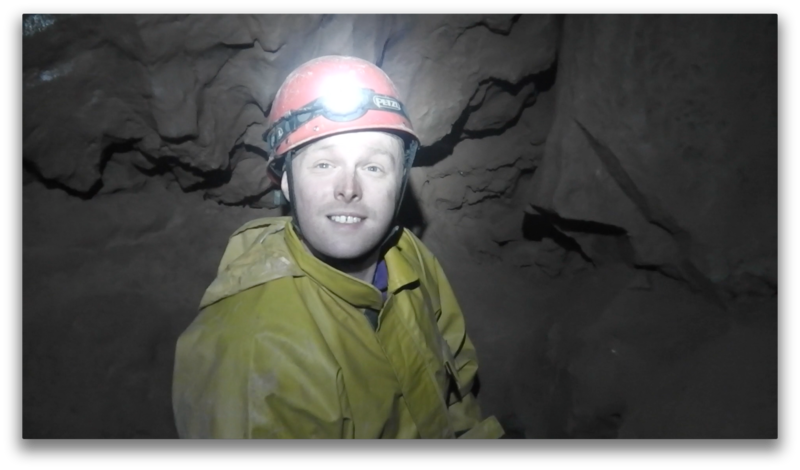 Well done Josh and Amy for there first attempt at rope work in a cave ,I think both will agree its a lot easier on the windmill. The club has had an influx of new members recently, all attracted by the website, Brendan’s photos and my videos. 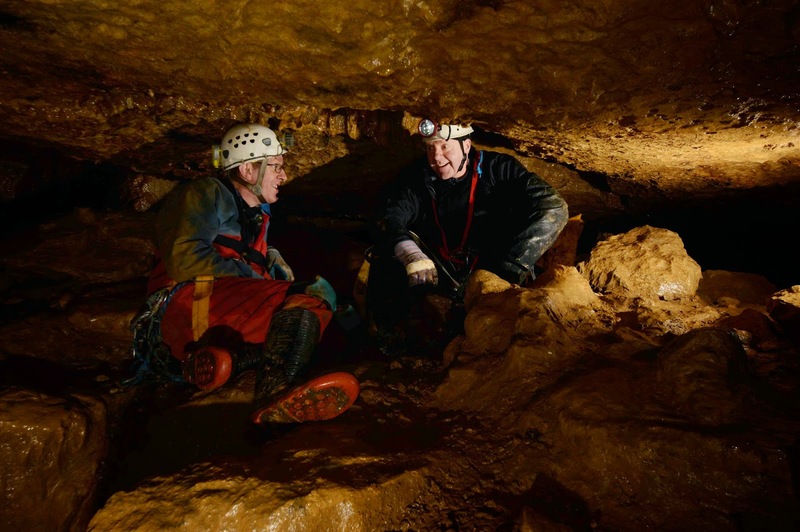 Attracting new cavers is one thing but getting them underground is quite another matter, as we are a small caving club with very few really active members. 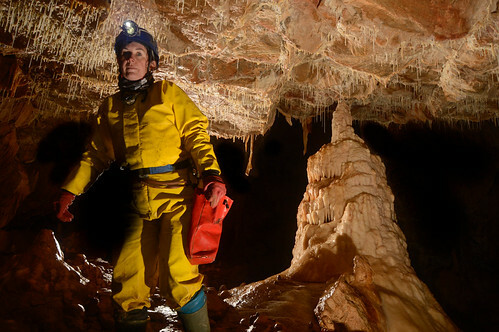 Step forward super-caver Mark who not only likes whoopy doo trips but also seems to get his kicks by putting new members through their paces. He chose a route in OFD 2 and recruited new members Mel, Tony, Rob and Rich. Ian who less than a month ago had undergone heart surgery decided to come along to test out his new widened arteries. ‘Navigationally challenged’ Jess joined the team to take Ian out if it proved too much, and Ian trusted her not to get lost, or did he? 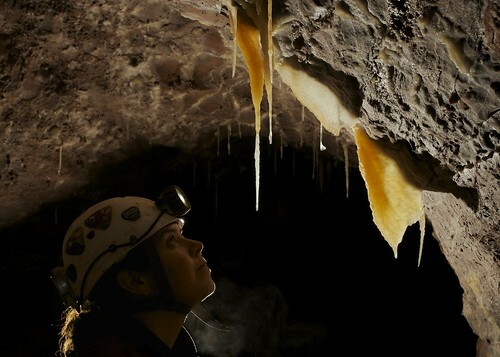 After my last trip two weeks ago I had decided to give up caving for good and take up knitting instead, but for some time now I’ve wanted to make an ‘introduction to caving’ video and an easy trip seemed like a good way to restore my shattered confidence. 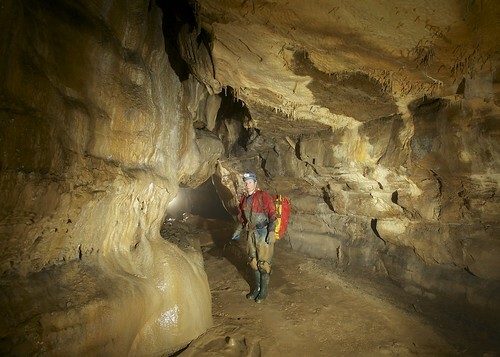 The route through the cave was: Main entrance passage, Brickyard, Gnome passage, Birthday cake, Corkscrew, Sandy passages to the Nave, Swamp Creek, Judge/Trident ,Crossroads, Top of Maypole Inlet, Cross Rift, Shatter Pillar, Squeeze down into Lugubrious, Selenite Tunnel, Crossroads, Passage to Salubrious via entrance to Pete’s Pretty Passage, Salubrious, Corkscrew, Birthday cake, Arete Chamber, Bagpipe Chamber, Big chamber near the entrance and out. This route meant that very little passage was traversed twice. 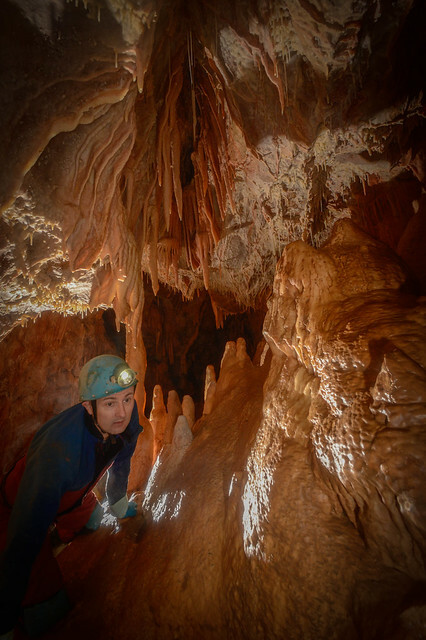 It also was a very good introduction to cave exploration, having climbs, squeezes, crawls, traverses, streamways, formations and plenty of slippery boulder hopping. So How Did They All Get On? In spite of Mark’s best efforts to break the newbies, they all seemed to love it and tackled everything thrown at them with apparent ease - tight squeezes, climbs and traverses. However Mark is having to sit on the naughty step for climbing up into Pete’s Pretty Passage and encouraging others to follow him. Ian stayed with us for almost the whole trip which was almost 7 hours underground. Was it a sign that the operation and recovery have been miraculous, or was he frightened of Jess getting him lost? Here's the video and a few stills from it. The team: Mark Burkey, Jess Burkey, Keith Edwards, Ian Millward, Rob Campbell, Mel Bell, Tony Ferrun and Rich Gibbons.